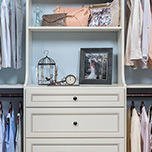 The cost of a well designed, built in home organization system that can increase space with shelving and the best organizers on the market is priceless. Your peace of mind to relax and enjoy your life living Cayman Island style is made easy with Storage Solutions. 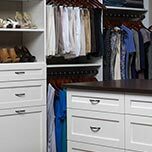 We are a team of closet organization specialists with a goal to give you the best space saving techniques, custom garage storage and custom closet design systems to get you organized. Our team of closet installers are experts in helping you receive the perfect luxury closet and home organization set-up. You have a hands on experience to use 3-D imaging to help design your closet with the best closet organizers in Grand Cayman! There are few closet companies who take the steps we take at Storage Solutions to guarantee complete customer satisfaction. From start to finish we are your closet design experts! Because Storage Solutions values you as a client, we would appreciate your feedback by leaving a rating on our Google+ page. 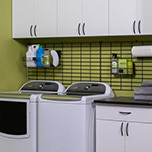 Complete Organization for Your Home in Cayman! Whether you are in need of a total garage makeover, updated closet systems or a whole new and renovated closet organizer system - our team of professionals at Storage Solutions makes certain you receive the best of care. We believe in living the simple life here on Cayman Island. In order to help you reach simple relaxation and a smoother lifestyle, we set you up with the best organization systems that are proven to save space and help keep you organized. 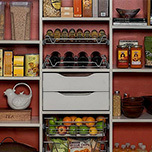 We use the best organization products in your home - each custom measured and fit to ensure its customization. 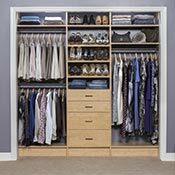 We know that just like every home, no closet is the same and no individual needs the same closet organizer system, which is why we always offer our clients free design consultations before we ever begin hammering the first nail! Luxury closets that are completely organized are not impossible! We have the accessories, storage solutions, custom cabinets and shelving systems to get your closet in the best shape ever! Whether you realize it or not, you probably spend a lot of time between the kitchen and the laundry room cooking and cleaning. Make those tasks more enjoyable with an updated organization system for both! Your home garage most likely is one of the messiest places in your home. 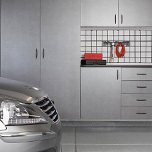 We can completely makeover your garage to include shelves, cabinets, storage systems and organizers, so you can keep it looking great at all times with ease! Increase your productivity! How? Check out our home office organizers; complete with custom cabinets, shelves, desktops and accessories. 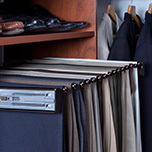 We will match your organization system to your home office needs! Contact our closet design team to deck out your walk-in closets, small closets, kitchen pantry and more!